Employee appraisals are an important part of today's HR Strategy, offering a reliable way to motivate, manage, and engage with employees. Empresa HR software appraisals are a flexible, simple way to record, remind, and track all areas of your performance management process. Empresa gives access to all previous appraisal details and notifications mean you will never forget about a scheduled appraisal. 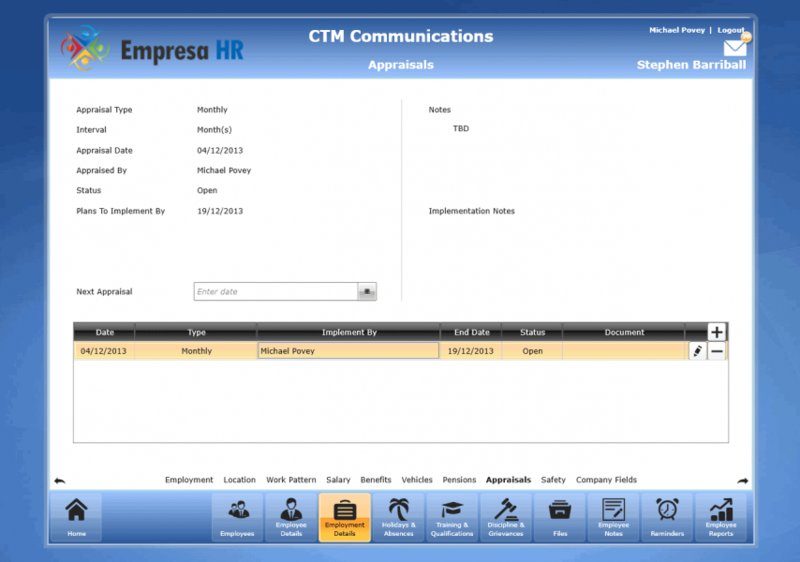 A great feature of HR software packages like Empresa is the capacity to track employee progress objectively and punctually. Configure appraisals to be preformed monthly, bi- annually, annually or for any other set period. Set notifications to ensure scheduled appraisals are performed within the required time frame. Store any action required with the appraisal and set a notification to ensure it is implemented within a set time. Assign any other member of staff to perform the appraisals for any individual employee. Save any supporting documentation with the record and view it from within each appraisal. Empresa notifications, coupled with the company dashboard, will prevent you from ever missing another appraisal. You can attach review documentation, mark employee progress on objectives, and score employees to compare performance against other employees.